Animal activist group PETA want to ban a century old custom in Seattle. 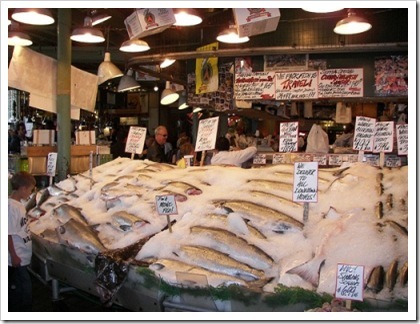 The fishmongers in the city centre, Pike Place [^] markets have long practiced the art of throwing dead fish over the heads of customers and sightseers. That’s right; they throw dead fish, not live ones. The organisation not only wants to ban the exhibition, but would ultimately like to see the airborne movement of fish “corpses” in the market banned as well. What should be remembered here is that the fishmongers have a vested interest in ensuring that their product, fish “corpses” reach their customers in the best possible condition. If their treatment of the fish harmed them in any way then the practice would not have survived for the past century. PETA seem to be using this event to campaign against the alleged cruelty of commercial fishing. We all need to realise that the production of meat, fish and poultry necessarily involves death and suffering by animals. This suffering is implicitly condoned and regulated by society. The regulation is an attempt to ensure that the death is as quick and humanely as possible, with minimal suffering. In choosing fights like this PETA only succeeds in opening itself up to ridicule.